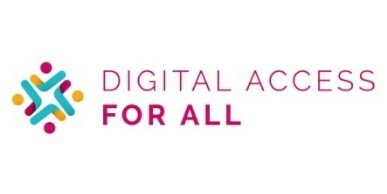 February 25th, 2018 London: Today sees the launch of ‘Digital Access for All’ (DAFA), a taskforce initiated by the Learning Foundation and Nominet, with a commitment to design and deliver solutions to the perennially stubborn problem of digital exclusion. Lack of access entrenches those already at a disadvantage by further negatively impacting their financial and educational future. The vision of the taskforce is to ensure that all children and young people in the UK have equal access to digital and the benefits it provides. Digital exclusion can lead to poorer health outcomes and a lower life expectancy, increased loneliness, social isolation, and less access to jobs and education. It can mean paying more for essentials, financial exclusion and an increased risk of falling into poverty. There is also a risk that digitally excluded people lack a voice and visibility, as government services and democracy increasingly move online. 11% of young people accessing the internet at home could not do so with a computer on a broadband connection. A further 6% connect to the internet via dial-up modems, technology that is now two decades old. However, for 12% of young people, (approximately 700,000 individuals), it is not possible to use these devices at home, creating challenges for completing school work. Two thirds (66%) of young people rely heavily on digital access to ensure they aren’t missing out on being with friends and feeling left out. Findings from this research show they can still face a number of perceived hurdles to doing more online; including parents’/ care givers’ permission to go online, household device sharing, negative online experiences and concerns around online security. The Carnegie UK Trust have also published a special new report, Switched On, produced specifically for the initiative. Switched On brings together research and evidence about key issues related to digital inclusion, with a particular focus on children and young people. Digital access challenges are compounded when you concentrate on young people experiencing vulnerabilities or focus on particular geographies, specifically rural locations and urban areas of high deprivation. The digital policy landscape is varied with a range of national and local policies covering different aspects of digital and young people. There is a need to shift the debate to talk about the full range of issues impacting on digital inclusion for children and young people, encompassing access to technology, an affordable reliable connection, and also the ability to utilise the online world effectively and safely. Adequate access goes far beyond simply owning a digital device. Over the next six months DAFA will be working with leading service design partners to shape a series of pilots that will test different approaches to delivering the initiative effectively across the UK. The DAFA initiative was developed by the Learning Foundation, a consultancy with a social purpose, and Nominet, profit with a purpose the company operating at the heart of the UK internet infrastructure responsible for the .UK domain space, as lead founding partners, with support from Lord Knight and Baroness Harding. Founding partners include Intel, Lloyds Bank, Microsoft, Argos, BT, Carnegie UK Trust, Computer Recyclers, Good Things Foundation and Greater London Authority. Intel: “Intel believes passionately that now more than ever families everywhere should have the opportunity to safely and confidently get online in their homes. Digital exclusion stifles learning experiences, denies access to services enjoyed by the majority of society and restricts the skills pipeline for the UK’s critical jobs of the future, that’s why the work of DAFA is crucial.”; Adrian Criddle, VP & Country Manager, Intel UK. Good Things Foundation: “Good Things Foundation is a social change charity, with the aim of a world where everyone can benefit from digital. Through our hyperlocal network, we’ve supported 2.5 million people to improve their digital skills since 2010, and we’re working with communities in the UK and abroad to help people be healthier, happier and better off through digital. Today in the UK, 11.3 million adults lack the basic digital skills they need, and for many of them, access is a big barrier to digital inclusion. We’re committed to getting 100% of the nation digitally included, so we can realise the economic benefits, and most importantly so that we can ensure we don’t leave anyone behind. This is why we’re so pleased to be involved with the Digital Access for All initiative. ” Helen Milner, Chief Executive, Good Things Foundation. Nominet is driven by a commitment to use technology to improve connectivity, security and inclusivity online. For 20 years, Nominet has run the .UK internet infrastructure, developing an expertise in the Domain Name System (DNS) that now underpins sophisticated threat monitoring, detection, prevention, and analytics that is used by governments and enterprises to mitigate cyber threats. A profit with a purpose company, Nominet supports initiatives that contribute to a vibrant digital future and has donated over £45 million to tech for good causes since 2008, benefitting more than 10 million people. www.nominet.uk.